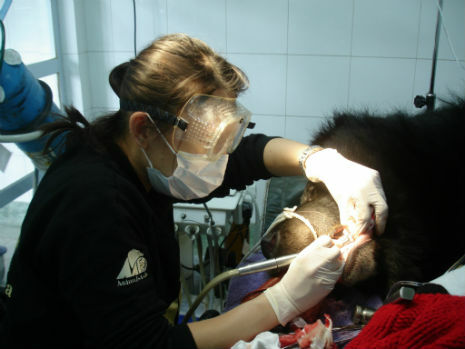 I first joined Animals Asia as a resident veterinarian and moved to the China Bear Rescue Centre (CBRC) in Longqiao, Sichuan Province in January 2010. By the end of the year, I was invited to step into the role of senior veterinarian, which I gratefully, though very nervously, accepted. From meeting Animals Asia’s founder, Jill Robinson, a truly inspiring and incredible woman, for the first time, to meeting more and more members of the team and family that is Animals Asia across the globe, I remain truly grateful for this opportunity to have joined their mission to end animal cruelty. Unless you visit our sanctuaries in China or Vietnam, I think it is hard to imagine what life and work are like for us. Thanks to a founder and organisation that prioritise the care of rescued bears, and to incredibly generous sponsors and donors, we have the privilege of utilising a high quality, purpose built, on-site hospital with top-notch medical equipment. These are truly impressive facilities, which the bears deserve. We live and work on-site, so the line between professional and personal is often blurred. Working at the CBRC is a truly unique experience that rather resembles an emotional rollercoaster. The days are unpredictable and can easily swing you from the hilarity of watching bears blowing bubbles in a pool, to the anxiety of bringing a sick bear to the local hospital for a CT scan, to the frustration associated with all-too-frequent internet blackouts, to the disbelief of being asked by officials to immediately rescue a macaque from a restaurant, to the heartbreak of having to euthanise sick and abandoned street puppies or kittens, to the exhaustion of completing a 10-hour bear surgery or lengthy bear dental, to the inexpressible emotion of observing a bear step out of her cage and feel grass on her paws for the very first time in 30 years, to the deeply touching experience of watching loving bear workers place carefully crafted flower wreaths upon a bear’s grave. Never before has my emotional world been pulled into such incredible depth and variety on a daily basis. Bears are incredibly intelligent, some very playful, others more nervous, but most are highly curious, and above all, they are remarkably forgiving. Bears are also incredibly stoic creatures who do not exhibit pain or discomfort in the same way as other animals might. Our challenge is to provide this population of previously abused, currently aging, and geriatric bears with the best quality of life we can. Some bears are missing limbs from being trapped in snares, others have been declawed by farmers or had their teeth cut down, sometimes arriving with self-traumatic wounds from stereotypic behaviors that developed due to chronic stress, anxiety and pain during their years languishing on bile farms. Sadly, these external scars are often just the tip of the iceberg, and the bulk of damage actually lies beneath the skin’s surface. 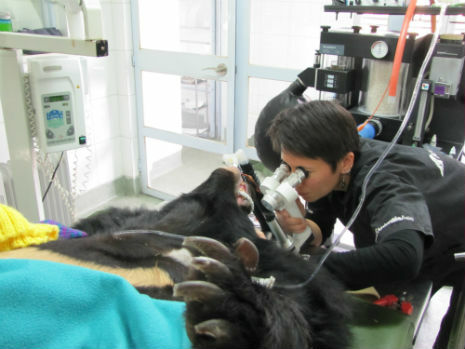 At CBRC, more than 30 per cent of rescued bears have died because of the development of liver cancer. The second leading cause of death is deteriorating mobility and/or spinal paralysis. A majority of rescued bears develop significant arthritis and exhibit abnormal conformations from living in cramped cages or forced into metal corset jackets. The third leading cause of death is cardiac disease – namely aortic aneurysms. We have a growing number of bears that develop kidney problems, eye disease and suspect hypertension. So many of these health issues have either only rarely or never been reported in any bear species. So why are these rescued bears developing so many health problems? After three years of living and working at the CBRC, I made the very difficult decision to leave in January 2013. However, Animals Asia gets into your blood and I knew I wanted to continue to help. I have returned three times in the past year to offer assistance to the veterinary team and I am now in the process of embarking on a PhD focusing on the major health issues and pathologies of bile-farmed bears. Hopefully this will allow us to answer some important questions and finally disseminate much of the stockpile of valuable information gathered from rescued bears since 2000. As we ring in the New Year of the Horse, however, I look back and think of my most memorable moments from my life here at CBRC. In addition to my main responsibility of caring for rescued bears, I have been so fortunate to participate in various animal welfare outreach programs, from capacity building of local veterinarians and veterinary students, to shelter outreach initiatives following mass rescues of dogs and cats destined for meat markets, to workshops assisting zoo professionals to provide better standards of care for captive wildlife here in China. These experiences have allowed me the opportunity to recognise the unique challenges facing the growing number of veterinary professionals, veterinary students, animal caretakers and animal lovers within China who are desperately struggling and fighting for better animal welfare standards and a kinder world for animals. My first rescue in April 2010 was of 10 bears from the last bear bile farm in Shandong Province. The grueling 4 day road trip, which included being stuck overnight in standstill traffic, and assisting with emergency bear surgery on the back of a truck, was all pretty memorable. We arrived back at the sanctuary in the middle of the night to a huge gathering of Animals Asia staff welcoming these bears to their new home. Buddhist monks were also awaiting the bears’ arrival, in order to bless them. I will never forget the intense abdominal surgeries we performed on every single rescued bear to examine them for any signs of liver cancer, remove implanted catheters or foreign bodies, and finally, to remove the horribly infected and traumatized gallbladders. These surgeries lasted anywhere from 4 to 12 hours, depending on the amount of trauma that had developed within each bear as a result of their daily bile extractions throughout the course of years spent in cages on bile farms. These surgeries, despite their grueling nature, have been one of the most rewarding experiences for me. To be able to observe each bear, waking up from their anesthetic, to see them with no more steel or latex catheter protruding from a dirty hole in their abdomen, no more infected bile and pus leaking out of their belly to stain their skin and mat their fur. All of that is now gone. Upon waking up from surgery, they can now look down only to see clean skin and a carefully sutured incision line, which is now concealing a clean abdomen, free of a damaged, infected gallbladder, free of gallstone, implants, or anything else to cause constant pain. From this day forward, this bear’s body can now start to heal. As a veterinarian, all the years of study, stress and training are all worthwhile to simply experience even just one moment like this. 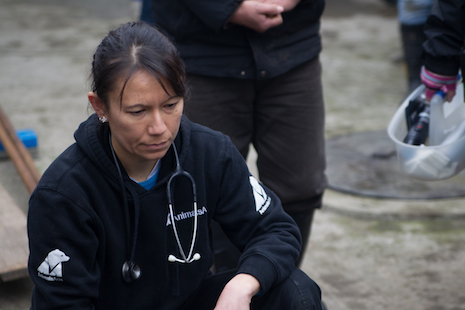 I remain ever grateful for every single experience since I first joined Animals Asia in 2010, for my empathy towards all animals, including human beings, has grown immensely, helping me to become a better veterinarian and a better human being. Wishing you and China and all the creatures of this planet, a safe and peaceful and healing 2014, year of the Horse! Xin Nian Kuai Le!